I hope all of the mothers following me had a great Mother’s Day. My mother died of breast cancer way too young, and I find myself missing her more and more as the years go by. She would really have loved our son, who often asks about my mom and dad. Probably the most poignant moment was the day he asked to take my parents’ framed portrait down from our fireplace mantel and put it on the cocktail table where he was playing with his trains so Grandma and Grandpa “could watch him playing.” He has a way of choking us up out of the blue. 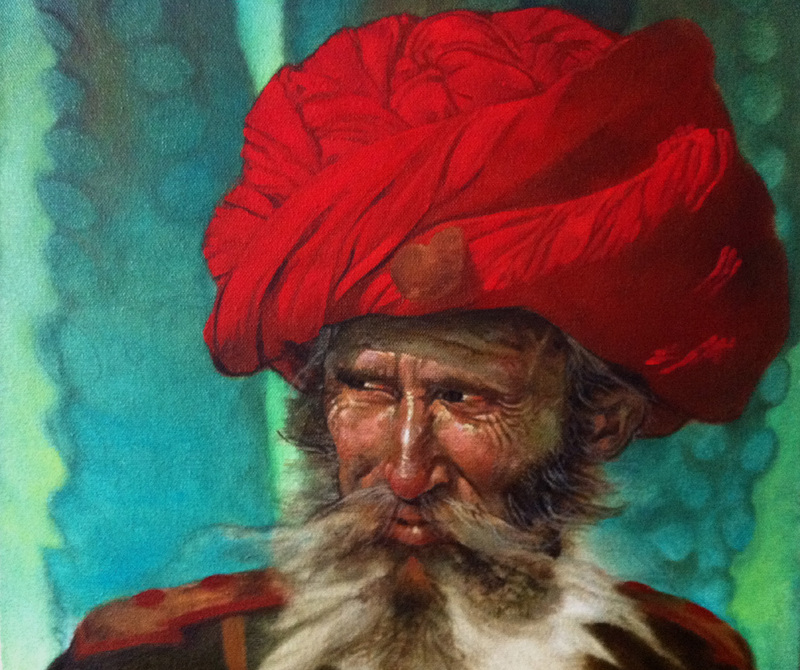 NEW ART I’M ACTUALLY WORKING ON TODAY – CAPTAIN NEMO: Here’s a snippet of the painting. I’m having a lot of fun with this piece, which is part 1 in a triptych I have planned. I will do a step-by-step blog when it’s complete, which should be in a few days. APPEARANCES: I had planned to participate in the Writers & Illustrators of the Future Awards event in Los Angeles this forthcoming weekend, but we need to stay home due to some in-law health concerns. My next public appearance will likely be Cherry Capital Con in Traverse City, Michigan at the Grand Traverse Resort the end of June. It looks like a fun show. Of course, we will be exhibiting at San Diego Comic-Con, same Bat time, same Bat channel (Booth #4500). Sharing my end cap booth this year will be Australian publisher Gestalt Comics, who does really great stuff and publisher Archaia who also publishes terrific graphic novels (who will be using a portion of my booth as their satellite booth location). I will have new sketch books this year, so watch for those! Thanks to friend and Devil’s Candy Store founder @Charlie_Athanas on Twitter who really pushed me to produce them. TECH NEWS: My friend and colleague Mike Bawden of Brand Central Station in Iowa is working with me on my new Web site, so I will post here when it’s up. Additionally, he and I are working on a Dave Dorman iPhone app, and I will let you know when it’s ready for you. One of my newer friends is the founder/owner of the blog DumbLittleMan.com, so be sure to check that out for life’s little tips. I am probably going to contribute some articles there and will post a link here. According to my wife, he gets GREAT SEO so if you write advice or tips articles, she says be sure to post there. PODCAST NEWS: Michael Mennenga of Farpoint Media (and the host of Slice of Sci Fi, now on SiriusXM Satellite Channel 80) has graciously offered to continue producing our podcast, It’s Comic Book Day, which is news, interviews and reviews of all pop culture-related stuff – artists, writers, directors, magazine editors, producers, musicians…you name it. Our podcast is free on iTunes, so please feel free to download it for your next workout or road trip. Okay, that’s all the news I have right now. Thanks as always for reading and for your interest in my work. This entry was posted on May 10, 2011 at 7:18 pm and is filed under Chicago Comic Book Artists, DAVE DORMAN NEWS, Illustration, Nerd Culture, Painting, Pop Culture, Social Activism, Social Networking, USACares.org, WriteBrain Media with tags Archaia, Art, Blog, Captain Nemo, Cherry Capital Con, Comics, Dave Dorman, Destin Middle School, DumbLittleMan.com, Farpoint Media, Gestalt Comics, Gulf Coast, Illustration, ItsComicBookDay Podcast, Julie Rahm, Military Kids Speak, Pop Culture, San Diego Comic-Con, SEO, SiriusXM, Slice of Sci Fi. You can follow any responses to this entry through the RSS 2.0 feed. You can leave a response, or trackback from your own site. Great work Dave. Just picked up your book. One of the best art books out today. Beautiful work, Dave! I’m sure fans will love this set at SDCC!